What is in a lowly cabbage? The answer is – more than you might think. The cruciferous vegetables, which include broccoli, brussel sprouts, cabbage, cauliflower and kale are one of the most important plant families. They owe their star status to two important compounds – isothiocyanates including sulforaphane and indole-3-carbinol. Together these compounds provide health benefits that are virtually unmatched, preventing cancer, supporting detox pathways and improving metabolism. Indole-3-carbinol has been shown to improve estrogen metabolism in women. When estrogen is broken down properly the risk of developing hormone sensitive breast cancer is reduced. 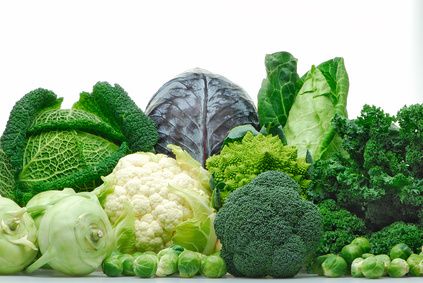 Consumption of cruciferous vegetable also reduces the incidence of bladder, lung and prostate cancers. Animal studies have shown that indole-3-carbinol has an anti-obesity effect, reducing weight gain and helping to resolve fatty liver disease. The isothiocyanates have mainly been studied for their ability to improve the function of liver pathways and detox enzymes. They reduce the accumulation of various toxins including methyl mercury. They are potent anti-oxidants preventing damage to our tissues by free radicals. In today’s toxic world provide essential support. Cruciferous vegetables can be eaten in a variety of ways. The highest concentrations of indole-3-carbiol have been found in broccoli sprouts. However most of the studies on disease prevention show that moderate dietary consumption, 1 serving of cruciferous vegetables 3-7 times per week, is protective. Because these compounds are heat sensitive it is best to eat the vegetables lightly cooked. They can also be finely chopped in salad such as coleslaw or cultured into sauerkraut or kim chee. Add the sprouts to your meals for a spicy boost. However you prepare them rest assured, by eating these delicious vegetables you are giving yourself the cruciferous advantage. Note: People with thyroid disorders should avoid raw cruciferous vegetables. They can worsen thyroid dysfunction.